App crashes when objects are named: help? I have recently encountered this problem, in my main storyboard (I only have 1) that whenever I name an object within the view controller label the object causes the app to not launch. When items are added with no name the program works fine however when an object is named it seems to cause a problem. Below I have screenshots as well as the app delegate code and RegisterVC.designer code. "Foundation.MonoTouchException: Objective-C exception thrown. Name: NSUnknownKeyException Reason: [ setValue:forUndefinedKey:]: this class is not key value coding-compliant for the key TestForXamarin." I am sure the problem is obvious to experienced users but I just cannot see it! NOTE: It doesnt matter what object I name (this one is a view) the error occurs with everything I name. It seems your view controller in the storyboard may have the wrong class, so your control's connection to the outlet in the designer.cs will throw this exception. Try to recreate a new ViewController and test this. 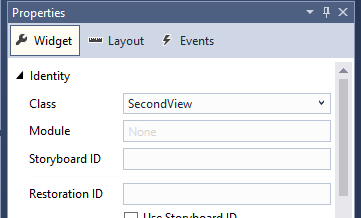 Type a class name in the class tab(try to use a new class name you haven't used before), then press Enter Visual Studio will auto generate a class for this view controller. You can add some controls you want in this view controller and named them there. That seemed to work great thanks!